A page from the Guidolon graphic novel I'm working on. Guidolon is the giant space chicken who comes to Earth to avenge the indignities done to birdkind at the hands of humans. 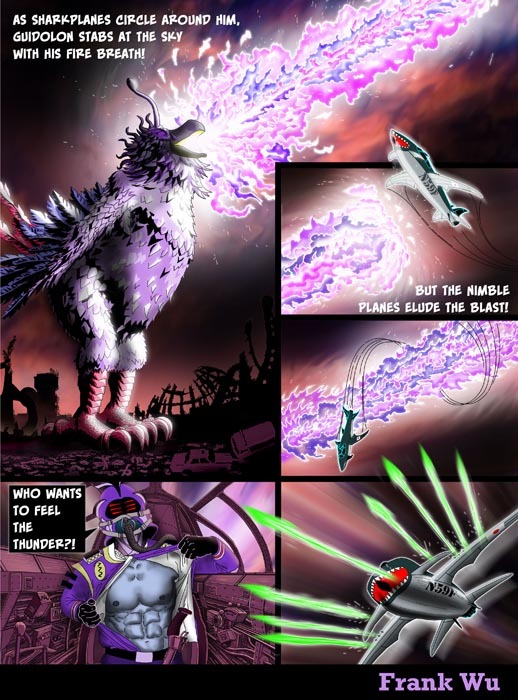 This project has taken on several forms, starting with a screenplay published in the anthology Daikaiju! Giant Monster Tales. Later, I did a short film, which was later revised. After that, I started work on a feature length movie, but it was just too much to do. We did release a short compilation of some of the work for that, though. And now it's being turned into a graphic novel!